Justin Ma: Recently I had a rough fight in an asteroid field and had to jump away with a number of my systems being damage. However, at the next beacon I was immediately attacked and boarded by a rebel ship. 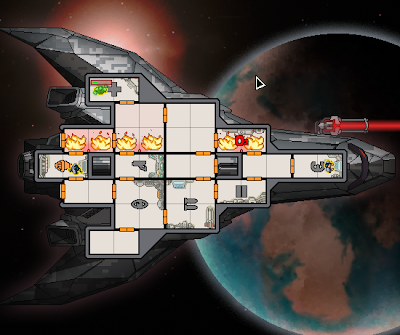 The boarders were in my weapons system and attacking it so I made a hasty decision: I teleported my few surviving crew members onto the enemy ship while locking down our blast-doors and using a bomb to make a hull breach in the weapons room of my own ship. While the boarders were suffocating, I finished off their ship’s remaining crew and disabled their weapons. I was able to win a fight I thought I would surely lose in a matter of moments. To paraphrase, his ship was messed up so he jumped it to a new location, only to have it boarded by rebels there. He teleported his crew onto the boarding ship, locked the door of the room the boarders were in, then breached the hull with a bomb so they would suffocate to death. Seriously, just take my freaking money already.